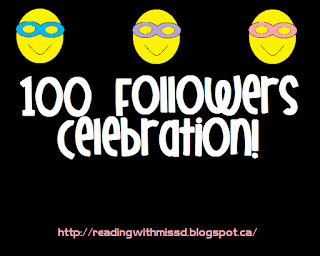 Mrs. D at Reading with Mrs. D. is having a 100 followers celebration. As part of this, she will feature 10 bloggers who post about the celebration and link up (click on the image to do so yourself). In these features, she will highlight five resources/ideas on these blogs. On the day of the last feature, she will post ten freebies that aren't in her Teachers Pay Teachers store yet. Best of luck to Mrs. D. in her endeavours!